New Year Fire! 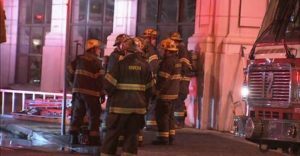 | People for People, Inc.
Did you hear about the recent electrical fire in our 800 building? It was quickly contained but we suffered extensive damage from the sprinkler system. The result was closure of the building for a week and now two weeks later we’re still facing costly repairs. This displaced 540 students of our Charter School, 126 infants and toddlers in our Early Childhood Development Center and dozens of staff members. Imagine the hardship this created on our families trying to get to work, doctor appointments and after school programs. Because of you and the good Lord willing, the needs of these people are met every day throughout the year by the programs you support at People For People. If a single small fire can cause such disruption in a week imagine what would happen if we suffered a greater loss and put countless families and children at risk. This is what your regular support of People For People helps insure against. Together, WE change lives! To help insure against loss I’m asking you to consider setting up a regular monthly investment for the coming year. Join our “Club 32” initiative, which is the number I wore as a Philadelphia Eagle. Simply commit to a monthly gift of $32 and I’ll send you a personal update and prayer reminder each month on how your investment is being used. With a little more effort you can “Donate Your Birthday” this year. All you need to do is send a request with the month of your birth to JCarroll@peopleforpeople.org (or text 610-742-0202). Prior to your birthday, Jim will prepare a personal link that you can use to invite your friends to send a gift to PFP in honor of your birthday. I’ll send them a thank you and forward you a list of all those who respond along with a total contribution received in honor of your birthday! Together, WE can resolve to make a difference in 2019 first, by setting up a simple monthly pledge and then by celebrating your birthday during this 30th anniversary year!